BeautyH2T: Illasmaqua Amnesty- you got me! Illasmaqua Amnesty- you got me! 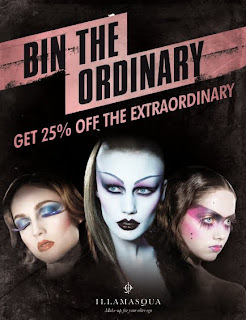 As you will have read the length and breadth of blog land, Illasmaqua are holding an amnesty, giving us the make up addicted a chance to swap all our dried up, falling apart and smashed make up in return for 25% off their products , old crap for shiny new lovelies. Hurrah. Some make-up can be ordinary – dull, boring, uninspiring. But not Illamasqua’s distinctive, rule-breaking professional make-up range. For a limited time only, you can exchange your second-rate make-up for a 25% discount on Illamasqua’s highly pigmented and exceptional products that give truly extraordinary results. This is your chance to get rid of the old, bland, mediocre make-up sitting at the bottom of your bag without feeling guilty throwing away barely-used make-up. So only a few days left to take advantage but I would definitely recommend it, I am new to their products and thanks to a ridiculously good, and nice MUA ended up walking away with one of their famed and hugely pigmented cream blushers, a cream foundation and an undereye concealer. I am so ashamed I promised not to buy beauty products as well, but I feel slightly comforted as I did have a £20 voucher for the shop I got it in, so it wasn't too expensive. Plus I got the phone of chucking 3 tatty old bits of horrible makeup. Full review of my new products coming soon, but so far I can say I am impressed! Why of why did I even go to check it out I knew I would not leave empty handed. @ the Caledonista, if you go into Debenhams you can see the big box of everyone elses make up sitting out on the corner. I wanted that to play through as much as the new stuff!